and technical ability to almost any conceivable requirement. Currently Morray offer the full range of Fuji-Ace robots from Fuji Yusoki Kogyo, which we consider to be the finest in the world for palletizing and de-palletizing applications. With superior reliability, speed, power efficiency, simplicity of operation and ease of teaching the Fuji-Ace is unparalleled in the palletizing marketplace. 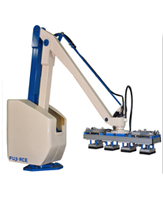 Unlike some other robot palletizers on the UK market, the Fuji-Ace was designed from the outset as a palletizing robot rather than a customised variant of a welding or general purpose industrial robotic unit. 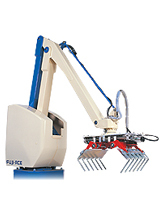 Because of this fact and the limited number of axis required to palletize versus tasks such as welding, Fuji Robotics were able to massively simplify and weight reduce the arm of their robots and use a far more efficient mechanical design for the accuation of the arm. Instead of using heavy, power hungry and complex cycloidal gearboxes with integrated servo motors specified by other manufacturers who integrate the actuation mechanism into their robot arms with the dead weight disadvantage this bring, all Fuji-Ace robots use external high efficiency servo motors with ball screws and timing belt drives. This appoach makes the robot simpler to service, parts are far cheaper in unit cost to replace and there is not surplus mass being carried by the robot arm. In fact Fuji takes this one stage further by making all Fuji-Ace arms out of high strength, low mass aerospace quality alloy thereby reducing the inertial mass of the system even further thus lowering the input power required. Finally, by statistically balanceing the arm with a counterweight, power is used only to move the load and not the arm itself. Easy & Cost effective solution to meeting the Manual Handling Requirements. System software can handle up to 4 varying product sizes onto 4 separate pallet positions - simultaneously. Speeds up to 1600 cycles per hour. Depending on the product, the multi pick-up facility allows speeds up to 5000 units per hour. Up to 200kg lifting capacity. The EC-61 is the most efficient robotic palletizer in its class utilizing only 2.3 KVA of power. Given the cycle rate to power ratio this robot provides the most economical solution while meeting moderate production requirements. The EC-61 is available in two models, a high speed solution, the EC-61HS and the EC-61HD for heavy weight applications. Similar to the EC-61, the EC-101 is also a very efficient Robotic Palletizer utilizing only 2.5 kva. The EC-101 offers a higher palletizing capacity than the EC-61 making this a very popular robot among moderate production rates. With two EC-101 models Fuji offers a solution for High Speed (HS) and/or Heavy Weight (HD) applications. 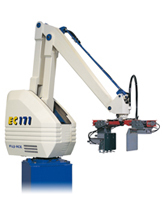 The EC-171 robot has the largest working envelope of all Fuji-Ace Robots while maintaining the smallest rotation radius. The EC-171 is energy efficient using only 4 kva while still allowing the robot to work in tight space conditions and accomplishing a very high palletizing rate. With two EC-171 models Fuji can offer a solution for High Speed (HS) and/or Heavy Weight (HD) applications. This is truly a fantastic addition to our product line.This new generation robot provides an ultra-quiet operation, improved efficiencies, and maximum flexibility. The Morray range of robots provides one of the most flexible methods automated product handling currently available. Each system is designed to exceed customer expectations. The EC-201 robot is one of the most technologically advanced robotic palletisers on the market today. With three EC-201 models to choose from, offers a solution for High Speed (HS), Heavy Weight (HD) and Super Heavy Weight (W) applications. This new generation robot provides an ultra-quiet operation, improved efficiencies, and maximum flexibility that accompany “high speed” palletizing technology. 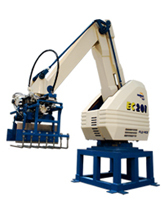 We offer a range of end effectors (hands) to handle a wide range of products. Such as bags, boxes, kegs, cans, tubs and bales. Also, we can design and manufacture an end effector to suit almost any product. Please contact us to discuss your requirements. Pallet Magazines- To supply empty pallets one at a time to pallet line. Can also be used to stack empty pallets in a de-palletizing system. Maximum stack - 900kg. Slipsheet and Tray Applicators- Automatically place plastic slip sheets from a roll, cardboard slip sheets from a stack and place then erect trays from a stack. pick up product. Harsh Environment Jackets- To protect the robot from hostile environments. W J Morray is a division of The Sack Filling and Robot Palletising Company Ltd.